If you fancy a new pool to enjoy the upcoming warmth of summer and don’t want to spend a fortune constructing one than the Intex Ultra Frame Pool might just be the answer to your prayers. With so many above ground pool options out there we have narrowed it down to the best of the best; Intex Ultra Frame. Why Intex? And why Ultra Frame? We answer these question and more by analyzing the product from all aspects to reveal why the Intex is so much better than the countless other options out there. Many factors were taken into consideration when preparing this review including; customer reviews, brand reputation, value, features, supplier credibility, warranty, customer service, shipping, add-ons are to name but a few. This comprehensive and detailed review provides customers with relevant, factual and insightful information that helps ease their decision-making process. 2 Why Intex Ultra Frame? Above-ground pools come in all shapes and sizes but few provide the level of diversity, practicality, and value than the Intex Ultra Frame. Inflatable above-ground pools are amongst the most cost-effective, easy to install and easy to maintain pools one can own. The good ones like the Intex Ultra Frame are made from heavy-duty vinyl supported by a steel frame that is powder coated to be rust-resistant for extra strength and durability. The Intex Ultra Frame also comes in many sizes, shapes, and configurations each one featuring its own distinct benefits and drawbacks. All the different configurations featured in this review come with a removable ladder, ground cloth, filter pump, debris cover, pool liner, and an instructional DVD that makes for easy installation and maintenance. All Intex Ultra Frame’s also come standard with ‘hydro aeration’, a new innovative technology that results in improved water clarity, better filtration and circulation, and softer feeling water. 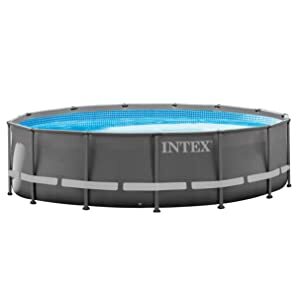 This 14×42 ft Intex pool is the ideal sized backyard pool for adults and children. The product includes all the equipment necessary for installation and maintenance such as a ground cloth, a removable ladder, filtration pump, and a debris cover that come with any Intex Ultra Frame you buy! 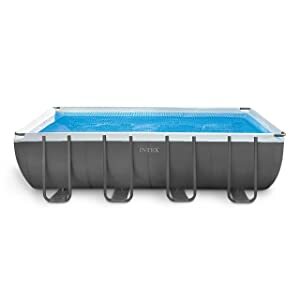 The Ultra Frame pool is designed to be durable and is made from a puncture resistant 3-ply vinyl, rust-resistant steel frames, and wider legs that is easy to assemble and disassemble. Its unique construction helps improve stability even on softer surfaces as long as they are level. The perfect addition to your backyard this coming summer for not just your family but friends as well. 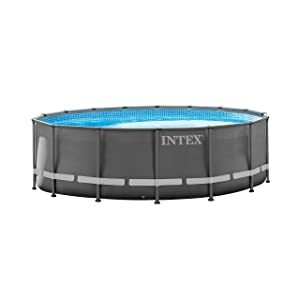 A pool this large would cost a fortune and take months to construct if it were inground but thanks to Intex’s Ultra Frame you can have a large sized pool set up in a day and get ready for fun-filled activities at an extremely affordable cost. The pool is designed to be easy to set up and install and shouldn’t take you more than 45 minutes if you follow the instruction manual. The Krystal Clear sand cartridge filter is the other advantage of this size compared to the one reviewed before. The more powerful filter pump keeps water crystal clear and clean by filtering through even fine sand particles. The rectangular frame allows adults and children alike to get a swimming pool like feel from this uniquely designed Intex Ultra Frame. If you are looking for something cool, stylish, affordable and relatively large in size this may be the ideal addition for that empty space in the backyard. At such a great price this product is a steal, especially since it comes with all the add-ons you would ever need as well as safety features that automatically stop the pump in case water touches the wiring. 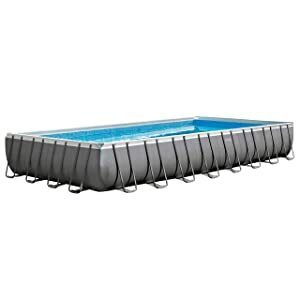 The sturdy design, ease of installation and water capacity of this pool is sure to make your neighbors jealous! 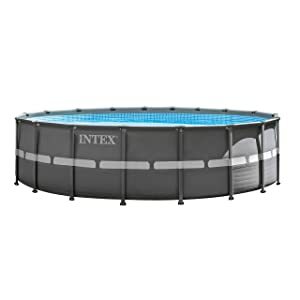 This large sized Intex Ultra Frame has a circular design offering tons of space for swimming, splashing around and having fun with the entire family. Safe for children over the age of 6 this particular Intex comes with a more powerful filter pump 2100 GPH to compensate for its larger water capacity and offers the option to choose a sand filter pump and a saltwater system which helps make maintenance easier and more cost-effective in the long-run. The salt water system is offered at a higher price. If you have a large family and require a place to cool off in the summers than look no further. Easily affordable, durable and practical this huge Intex is just what your family needs to get together and bond while enjoying the refreshing clean water. This rectangular pool offers much in terms of comfort and practicality. The large rectangular frame is sturdy and durable yet easy to assemble thanks to the innovative frame design and easy lock system. Great pool to get some swimming laps in especially for children still learning to develop their swimming skills. Large water capacity and size makes it great fun for the entire family and the choice between having a sand filter and a saltwater system is simply ingenious and makes this Intex as versatile as it is practical. Even though it is more expensive than the circular models featured here its design, shape, size, and durability give it the look and feel of a high end swimming pool for a fraction of the cost. This the most premium configuration available in the Intex Ultra Frame catalog. The large size and water capacity offers the experience of a full-sized swimming pool but at a fraction of the cost. Its heavy duty construction and steel support frame make it extremely durable and sturdy. The powerful 2800 GPH sand filter system maintains water hygiene and clarity levels with the option to get a salt water system as well. Even though it may seem expensive this above ground pool is a steal for the price. For such levels of durability, size, and add-ons this is the ideal large sized budget pool solution. The versatility, practicality, value, and convenience that the Intex Ultra Frame provides is incomparable to most other brands out there. The Intex Ultra Frame product line alone has a solution for every new and existing pool owner who wants something that is affordable, durable, stylish and easy to maintain. Its unbeatable value, excellent customer service, and distinct features have made it Amazon’s #1 Best Seller in the ‘framed swimming pools’ category and you can certainly see why.